A technology that could lead to a zero-emission engine solution is one of the Research & Development projects conducted by FPT Industrial. During its Tech Day 2018 event, the company is demonstrated a Hydrogen Fuel Cell Powertrain concept designed for heavy-duty applications. As a multipower solutions provider, the mission of FPT Industrial is to study, test and overcome the constraints to make hydrogen a viable and effective solution – especially for energy demanding applications, thereby delivering performance, autonomy and reliability. The combination of electric and fuel cells generates a zero-emission vehicle, reinforcing hydrogen as the evolution of Natural Gas for long-haul applications. Thanks to the advantages of hydrogen for the environment – it is the cleanest fuel possible – FPT Industrial is preparing to lead innovations in this area. Hydrogen could also become paramount in the development of a circular economy, as it can be produced locally through renewable resources from biomethane, wind or solar energy. 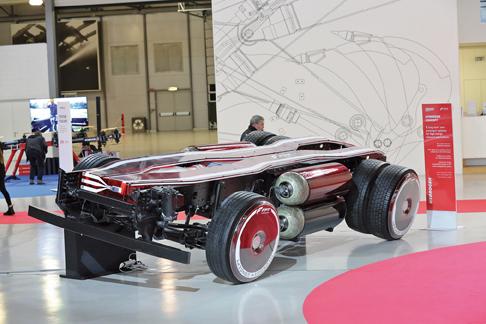 The powertrain system developed by FPT Industrial delivers maximum power of 400 kW (535 hp) and comprises the hydrogen tanks, a fuel cell module, a lithium-ion battery pack, an e-axle and an energy management system. The fuel cell supplies energy to the e-axle, which ensures that the performance is aligned with that of a diesel powertrain. The electric motor integrated in the axle gives power to the wheels and, thanks to smart logic control, ensures the lowest energy consumption possible. The lithium-ion battery supports the fuel cell during the most demanding operations and stores energy during the vehicle deceleration phase. The energy management system provides the minimum amount of energy to satisfy the specific power demand. Depending on the system condition, the software can balance the energy through battery and fuel cell to give the required energy to the e-motor. This will ensure that the fuel cell has a durability of 20,000 hrs. This FPT Industrial proprietary management system coupled with hydrogen tanks can also guarantee an autonomy of around 800 km. Considering a future scenario, the FPT Industrial Hydrogen Fuel Cell powertrain will have among its advantages: the highest sustainability with zero-emissions regarding noise and pollutants, diesel-like performance, a similar weight to a diesel powertrain, making a vehicle thus equipped 70% lighter than a battery powered variant (considering a 40 t GVW truck), and 6 times faster filling time than a battery vehicle – the fuel cell has a refilling time of around 20 minutes, while batteries currently take up to 2 hrs. FPT Industrial is a brand of CNH Industrial, dedicated to the design, production and sale of powertrains for on and off-road vehicles, marine and power generation applications. It offers a wide range of products, including 6 engine ranges from 42 hp up to 1,006 hp, transmissions with maximum torque of 200 Nm up to 500 Nm, front and rear axles from 2 to 29 t GAW (Gross Axle Weight). FPT Industrial offers the most complete Natural Gas engines lineup on the market for industrial applications, including engine ranges from 136 hp up to 460 hp.